JNN 26 Aug 2014 MAKKAH — The Saudi Kingdom could earn about SR32 billion ($8.5 billion) from this October’s Haj, according to a study published on Monday, which predicted that two million Muslims would make the pilgrimage to Makkah. The Makah Chamber of Commerce said revenues from the world’s largest annual gathering of Muslims would increase by three percent from last year. The study was based on estimates that 1.98 million pilgrims will travel to the holy city of Makkah, including 1.38 million, or 70 percent, from abroad. According to the report, a pilgrim who has traveled from another country will spend an average of SR17,381 ($4,633) during Haj, which runs for five days. A domestic worshiper pays around SR4,948 ($1,319), the study found. Expenses include housing, food and drink, gifts , Transportation and Phone bills. Millions of Muslims from all walks of life converge to Saudi Arabia to perform the Holy pilgrimage known as the Hajj Every Year in the Month of Zil Hajjah , a pilgrimage all Muslims are expected to make at least once in their lives if health and finances permit , while the Pilgrimage of Makkah and Medina , Revolves around the year , with its special emphasis in the Holy Month of Ramazan , which adds also Billion of Dollars Income to the National Exchequer of the Saudi Arabian Govt. The annual occasion is always Been a lucrative business for the Saudi Govt , proving a great financial asset to the economy of the oil-rich kingdom. Many pilgrims, however, struggle to reconcile their spiritual needs with their wallets. Mohammed Zayan, a 53-year-old pilgrim from Tunisia, has waited a lifetime to perform the religious obligation, which does not come free. “I spent up to $6,000 (£3,700) on my Hajj,” says Mr Zayan, who wears the traditional white pilgrims’ clothes. The millions who come to Mecca every year bring billions of dollars to the Saudi economy. Restaurants, travel agents, airlines and mobile phone companies all earn big bucks during the Hajj, and the government benefits in the form of taxes. In the year 2012, the 10-day event generated some $10bn (£6.2bn), according to the Chamber of Commerce in Mecca. The private sector also maximises its returns during Hajj, with investment in real estate an attractive proposition ahead of the pilgrimage. The highest rents in Saudi Arabia are found in the holy city of Mecca, the birthplace of Islam. Owners of hotels close to the main mosque ask for $700 a night, blaming the skyrocketing prices of land for the sharp rise in rates. The ancient city’s centuries-old sites are giving way to glitzy luxury hotels, which are not affordable for many pilgrims. The government says it is a necessary step, even if the construction comes at the expense of historical & Religious value mountains dating back to the age of the Prophet of Islam Muhammad PBUH and his companions. Selling Mecca souvenirs is another very lucrative business during the Hajj. There are no official estimates for this profitable trade, but it is believed to bring hundreds of millions of dollars every year. Majority of Muslims leave Mecca laden with presents and souvenirs for loved ones back Home. With a feeling in their Mind as Taking these as blessed souvenirs, While their Prices are almost three times their original price outside the city. The price of Mecca souvenirs is often eye-wateringly high and most of the products like prayer mats and beads are not made in the city, but rather in China. But Mr Abdel Rahman says he feels a great spiritual relief when he spends his money in Mecca. Hajj is one of the five pillars of Islam and an obligation, provided a Muslim is financially and physically able. The Religious Act, which demonstrates the unity of Muslims and their submission to Allah, has been carried out Since the Birth of Islam. The King of Saudi Arabia , whose government earn Billions of Rupees from the Pilgrimage of Hajj and Umra every year , Yet Nothing is done by the So called Custodians of the Holy Mosques , which can Benefit Muslims , especially the Poor and needy who are Unable to Perform the Holy Pilgrimage , due to the ever rising cost of it , Instead whole of the Royal family Members, which includes the Prince and Princesses are these days busy in doing franchises with the five star Hotel chains of the World and Building Sky Scrapers in the vicinity of the Holy Mosques , so it can benefit them in earning Huge Profits from the revenue it generates , due to the high rates of their 5 Star Facilities. 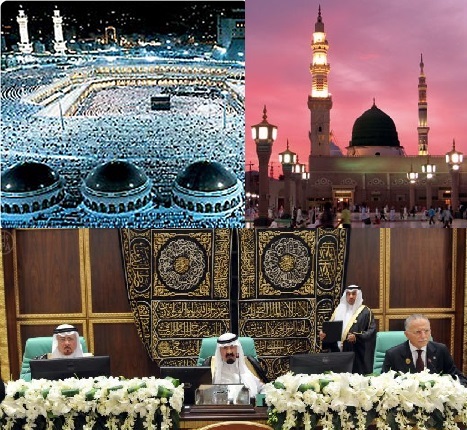 The Real Custodians of the Holy Mosques will be those People who can think of the Miseries of Millions of the Muslims around the World , and can do all in the World to make the Pilgrimage for the Muslims affordable and economical , so more & more Muslims can Perform their Religious Duty of the Holy Pilgrimage . But On the Contrary the Buildings and Accommodation and travelling which was More economical for the average Muslims in the Past , has become more expensive Under the Rule of the Saudi Monarchy, by Demolishing the Old average Rent Buildings and replacing them with Most Expensive 5 Star Hotels , which is out of the reach of the common Muslims , who wish to do the Holy Pilgrimage Just Once in his/her Lifetime . At the same time the fare of the National Saudi Arabian Airlines have also sky rocketed over the years , even though the God Has Gifted the Holy Land with the Natural resources of the Oil , and if they want they can even subsidize the Fare of the National Saudi Arabian Airline for the Muslim Pilgrims , which will be nothing from their Own Wealth, But from the God Gifted , availability of the Huge amount of the Oil reserves , and secondly cutting down the amount of all the direct and Indirect taxes levied on the Muslim Pilgrims to the Holy land. The Wealth of Natural Resources or the amount of Income earned from the Pilgrimage of the Muslims of the World , should be used for the benefit of the common man and not for the luxuries and use for the Immoral activities of the Rulers and their family Members , of the Most sacred land of Islam, who claim to be the Custodians of the Holy Mosques , But rather their acts have Proven that they are the usurper of the Wealth of the Muslims. This entry was posted in Middle East and tagged Custodian of Holy Mosques, Hajj, Holy Mosques, Holy Pilgrimage, Mecca, Saudi Arabia, Saudi Arabian Govt. Bookmark the permalink. THIS COMMENT IS IN FACT AN APPEAL BY ALL THE SHIA-SUNNI MUSLIMS OF THE WORLD INCLUDING ALL ARABS & AJAMIS AND ALL THOSE MUSLEMEENS LIVING ANYWHERE IN THE WORLD . 1. MAKKAH AND MADINAH BOTH BE GRANTED AN INDEPENDENT STATUS LIKE THE VATICAN AND SHOULD HAVE ITS OWN INDEPENDENT ADMINSTRATION WITHOUT ANY KIND OF INTERFERENCE FROM THE SAUDIS . 2. VISA AT THE LANDING WITHOUT ANY VISA FEES OR ANY KIND OF TAXES . 3. SUBSIDISED TICKETS FOR TRANSPORT FROM AIRPORT TO MAKKAH OR MADINAH AND MAKKAH TO MADINAH . 4. FREE SHARED HALLS ACCOMODATION NEAR THE TWO SHRINES . ENOUGH NUMBERS FOR ALL THOSE WHO CAN’T AFFORD HOTELS . 6.CONSERVATION AND RESTORATION OF ALL SACRED HERITAGE IN MAKKAH AND MASDINAH FOR WHICH GOVERNORS BE APPOINTED. 7. IN CASE OF THE PRESENT SAUDI GOVT NOT CONCEDING, TOTAL BOYCOTT OF HAJJ AND UMRAH TILL THE NEW STATUS IS IN FORCE.